Join us on Saturday May 4th for the Franklin 5k! The course starts & ends at Franklin High School. The run/walk will proceed through the Oak Leaf Trail. Designed for all ages & athletic abilities. Strollers are welcome. Check in begins at 8:45AM at Franklin High School, 8222 S 51st Street, North parking lot. Run/Walk will proceed to Oak Leaf Trail. Register before April 22nd to guarantee a t-shirt size. Join us as we welcome speaker John Underwood, former NCAA All-American, International-level distance runner, World Masters Champion and Olympian coach. This presentation will inform community members on lifestyle choices and their impact on mental and physical performance. Volition Franklin and the Franklin Health Department are partnering to stock the shelves of our Franklin Little Libraries across town! Regular meetings are held the second Thursday of alternating months from 6-7:30 pm at Franklin City Hall in the Hearing Room. You do not need to be an official member to attend! All are welcome. 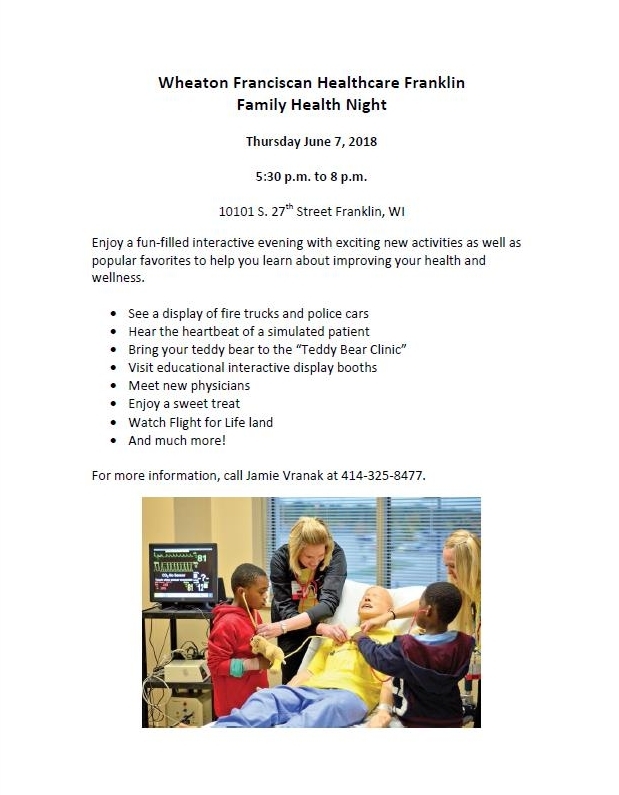 Join us at the Wheaton Franciscan Healthcare Family Health Night in Franklin! Join us as we raise awareness and highlight prevention efforts in our Franklin community! Monday & Tuesday we will be in our Franklin Schools facilitating an activity and throughout the community the rest of the week! Keep an eye out for the display of our National Prevention Week project at the Franklin Public Library or stop by the Franklin Health Department during the week of May 13th-19th to participate and be entered for a chance to win a free 1-week Innovative Health and Fitness Pass! Join us at Growing up Digital, a Franklin Public Schools Community Event. Parents of school-aged children & community members are invited to join the Franklin Public School District, the Franklin Police Department, and Jenny Heckman, private practice licensed counselor, to equip you with background knowledge and practical actions you can take as a parent to protect, monitor, and engage your children of all ages around technology use & the impact it is having on your child’s emotional intelligence and personal well-being. Volition Franklin will be in the lobby with resources and information! Catch up with us on the sidelines of Saturdays Youth Soccer Games at Ben Franklin Elementary. We will be at the youth soccer games sharing underage drinking prevention information! Medications play a pivotal role in our wellness, allowing us to improve our quality of life. Yet some medications have the potential to harm as well as to heal. Join Volition Franklin and the Franklin Health Department as we welcome Certified Senior Advisor, Claire Sedushak who understands the perils and pitfalls of this challenging balance. Ask the right questions when prescribed an opioid medication—the potential for abuse, the risk of dependency, whether other medications are just as effective. Manage multiple medications while avoiding the risk of interactions and side effects for living a better quality of life. Implement a proven system for regularly taking medications to improve your wellness. Avoid problems with vitamins and supplements which can impact your medications. Beating the winter blues with some Saturday shopping? Swing by our resource table that will be at Southridge Mall near Starbucks. We look forward to meeting more of our community members and sharing information about what we do as a coalition! Want some fun give aways? We will be at the Franklin High School Basketball Games distributing all things red for Light and Unite RED week! Stop by to grab a fidget spinner pen, pop socket, reusable bag, and Marquette Basketball player trading cards! Volition Franklin will have a table at the 2nd Annual South Milwaukee Resource Fair. Come out and join to gather information regarding substance use prevention and treatment! Light and Unite RED is a Milwaukee County wide campaign shining a spotlight on the dangers of substance use and highlighting prevention. Volition brings this campaign to Franklin by partaking in various events January 22-28, 2018. Volition Franklin will be offering a Free Narcan Training led by Chelsea Watry, Prevention Specialist, from the Aids Resource Center. The session will include an overview of substance abuse/heroin overdose 101, demonstrate both the nasal and injectable preparations of narcan and answer any questions that we may have on substance abuse overdose and how to treat it. Alcohol availability and easy access to alcohol are related to greater consumption of alcohol and alcohol- related problems among adolescents. Throughout the months of December and January, Volition is implementing a community wide campaign focused on raising awareness of the dangers of underage drinking and how to take steps to prevent alcohol from being misused. Student PSAs will be rolling during the preview before all the movies at Marcus Showtime Cinema in Franklin during the months of November and December. Show up for any movie during and see the Franklin Youth PSA promoting positive choices! Join Volition Franklin in recognizing Red Ribbon Week – an annual campaign uniting communities across the nation in their stand against drugs and commitment to a drug-free lifestyle. Prescription opioid abuse is a problem we are facing here in Wisconsin. To raise awareness and educate community members, Volition Franklin is sponsoring the showing of one of the Dose of Reality campaign PSAs at our local theater before each movie for the next month!